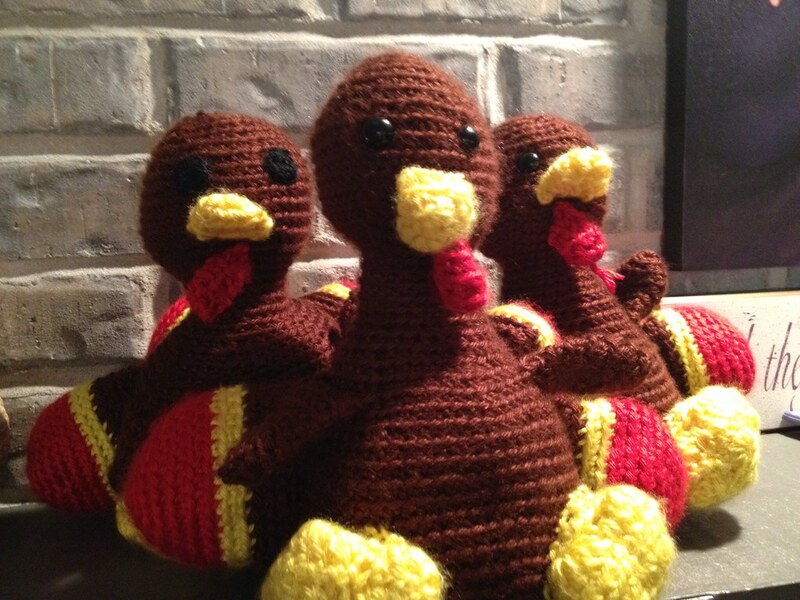 Thanksgiving may be over, but that's no reason to not show off the trio of turkeys I made for my nieces. I get these ideas in my head sometimes. Ideas for things I don't really have time for (like crocheting 3 turkeys). But it had to be done. And they loved them! The oldest of the three is 4 and she loves her "special knitted toys" from auntie. I'm working on teaching her that these are crocheted...but I'm glad she cherishes my handiwork. The pattern is (of course) a FreshStitches pattern. It's Amigurumi Alvin the Turkey. I also think he could be worked up in peacock colors. Which is good, because I have a peacock-obsessed friend with a baby. That baby may need a peacock in a few months for his birthday. So now it's onto the Christmas gift knitting. I don't have much to do, but will probably have a late night or two in coming weeks to get it done. Oh darn, I have to stay up late, knit and watch cheesy Hallmark Christmas movies. :) Working on Christmas knitting? Let me know what you're making over in the Ravelry group!